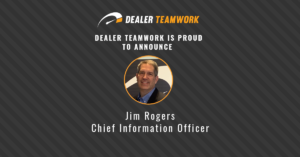 Since the beginning, customer service has always been the prevailing priority at Dealer Teamwork. Strategic restructuring to the Client Services team and additions such as Jennifer Beckman and Lani Almen have only strengthened the growing department. 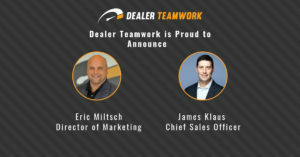 Continuing to round out this team is key to fostering successful relationships with dealers. 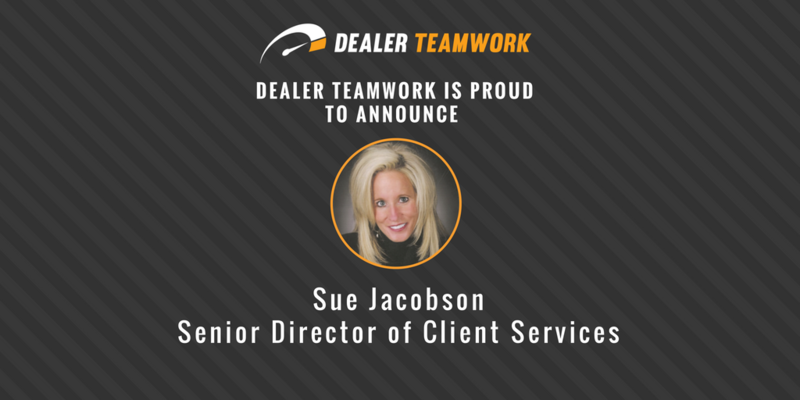 It is for that reason that Dealer Teamwork is delighted to announce Sue Jacobson has joined Dealer Teamwork as Senior Director of Client Services. 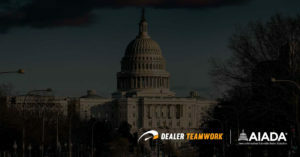 Sue comes to Dealer Teamwork after having spent nearly 40 years in the automotive industry, with both large manufacturer and dealership experience. She began her career in automotive at Ford Motor Company where she worked as a New Vehicle Merchandising Manager. After 5 years at Ford, Sue made the move to the dealership world by joining Tousley Ford where she held roles such as Merchandising Manager, Sales Manager, General Manager, and Minority Owner. After the acquisition of Tousley Ford by AutoNation, Sue stayed on as General Manager of AutoNation Ford White Bear Lake where she remained for 20 years. During her time as General Manager of Ford White Bear Lake, Sue proved time and time again that she was suited for business operations and customer service. Her store was ranked #1 in overall dealer profits by Ford for five of the past 11 years. She has also been awarded AutoNation’s most prestigious Tim Pring Award. Additionally, she has received the One Ford Elite, Triple Crown Award and the President’s, among many others. With recognition throughout the industry, Sue Jacobson is perhaps one of the most decorated women in automotive history. 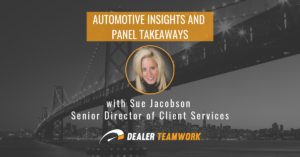 From her time spent in dealerships, Sue has seen how digital marketing has transformed the automotive industry and what products like the MPOP™ can do to help car dealers engage customers and drive sales. This realization is what ultimately lead Sue to Dealer Teamwork. As Senior Director of Client Services, Sue is excited to enhance client-account manager relationships with the goal to provide world-class service and exceptional value to Dealer Teamwork clients and partners.